We left Lee Vining, CA, and the Eastern Sierras for a wonderful and crazy drive up and over the mountain range into the western foothills — stopping first in Pine Grove and then continuing down to Mariposa. 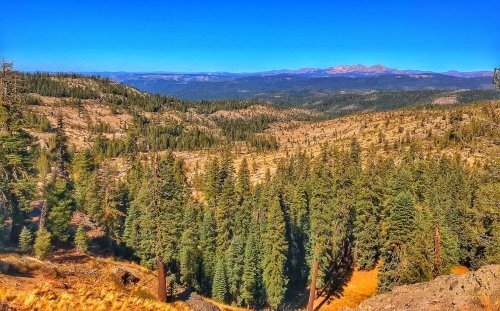 Our drive took us on Highway 88 through the Eldorado National Forest, located mostly northeast of Sacramento (and tucked between Tahoe National Forest to the north and Stanislaus National Forest to the south). What we loved most — besides the amazing conifer stands — was that some major commercial and pre-commercial thinning was taking place in the forest. 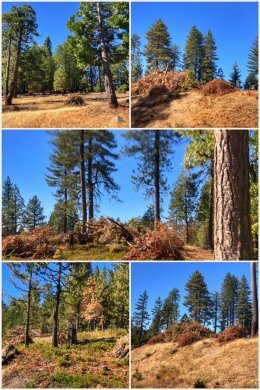 As you can see in the pictures above, people have been busy thinning the number of trees (which is essential to forest health), as well as pruning up the remaining trees (removing lower branches for both wildlife and for reducing fire risks). These forest practices are essential to producing healthier trees that grow taller and are more resistant to environmental damage (such as drought, storms, beetles, etc. )… and, sadly, most of the national forests and national parks we have visited so far on this trip have forests that are dangerously overgrown and untended — and unhealthy. Not sure why people cannot come together in the middle — we need timber harvesting to thin forests, but these harvests can be done in a responsible manner that does not strip the forests of too many trees… it is all a balance, but loggers and environmentalists seem so far apart at times — tying the hands of forest managers to do what is BEST for the forests. Pine Grove is nice little town in Amador County with a beautiful campground. We were thrilled to discover farm-fresh eggs at Gold Country Ranch, just down the street from where we were camping. And proving that the world is a small place, the ranch manager had lived in Eastern Washington for many years! 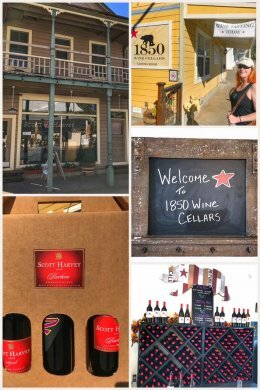 While there are some cool things to do near Pine Grove (such as Black Chasm Caverns and Indian Grinding State Historic Park), we decided it was time for some more wine-tasting, so we headed to Sutter Creek — the heart of the foothills wine production. While there are several tasting rooms in town, only a few are open on weekdays. We started our tasting at Scott Harvey Wines, which offers a tasting flight for $7 per person (with fee waived with purchase). The building is beautiful and the wines delicious — and our server was friendly and knowledgeable. We bought several bottles, including a Barbera (which is THE variety of the area) and Zinfandel (which is one of OUR favorite varietals). We concluded with a stop at 1850 Wine Cellars, part of GoldLine Brands. We had a lovely tasting there — and left with several bottles of wine, including a Viognier (a rare white wine purchase for us), as well as a Zinfandel and Pinot Noir. Next, we traveled to Mariposa, another historic gold-rush town and a gateway to Yosemite. It is a home of many things, but mostly home to our dear friend Nikki, who is such a strong supporter of our marriage — and of this crazy adventure we are on. 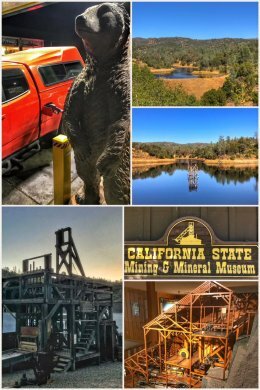 Besides Nikki, Mariposa is home to the California State Mining and Mineral Museum, which offers an amazing look into California’s rich history of mining — and features a collection that contains many exceptional specimens of gemstones and minerals, including gold, silver, copper, and platinum. It includes a cool walk-through mining tunnel and a scale version of a mining stamp mill, as well as precious gem and mineral specimens from around the world. We camped at the Mariposa County Fairgrounds over a weekend that included a Friday night high school football game, a hot rod custom car show, and a rock and mineral swap meet. You have to love small town life! We ended our visit with a fun hike through the Stockton Creek Preserve, located just north of town. Next up? A return visit to Lodi — home of old vine Zinfandels — as we slowly make our way back to the San Diego area for the holidays.